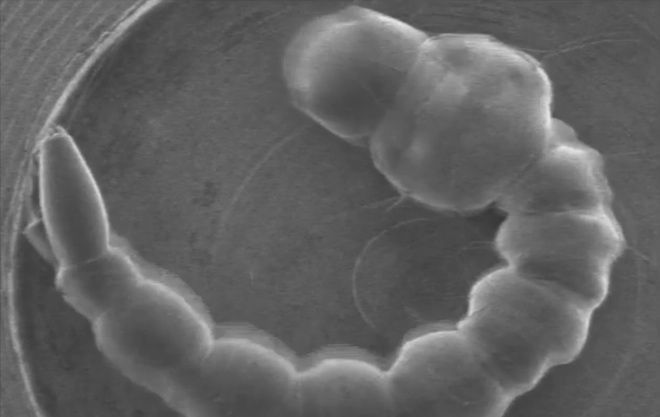 Mosquito larva wiggles in a scanning electron microscope vacuum (Credits: Yasuharu Takaku et al). Scientists have developed a thin polymer membrane, or nano-suit, that enhances survival in vacuum. Takahiko Hariyama of the Hamamatsu University School of Medicine in Japan and his colleagues have found that bombarding creatures with electrons causes a thin polymer membrane to form around them, protecting them from the harsh conditions of vacuum. The experiments were conducted on fruit fly larvae. When the larvae were put in a vacuum, it resulted in rapid dehydration and death. To protect them from dehydration, the scientists bombarded the larvae with electrons which formed a thin polymer membrane over the larvae. Under similar vacuum conditions, the larvae covered with the electron membrane survived and continued normal movements such as wiggling. These protected larvae even grew into health fruit flies, with no noticeable impact from their exposure to vacuum. Under a microscope, scientists discovered that due to the energy from the electrons, polymerization of the skin molecules had taken place, forming a very thin layer, approximately 50 to 100 billionths of a meter thick. The layer has characteristics such as good flexibility allowing motion of the larva, and is solid enough to keep its bodily gases and liquids from escaping. “Even if we touched the surface, the surface did not break by our mechanical touch. It was almost like a miniature spacesuit,” said Hariyama. The team also performed similar experiments on other insects like mosquitoes, ants, and sand hoppers. The results showed that the nano-suit protected these insects from dehydrating in vacuum as well. The nano-suit concept has vast application potential, including breakthroughs in Space Suit Technology.